We’re halfway through 2017, which means we’re only 6 months away from MLS’s final decision on expansion teams. SBI, a website focused on coverage of American and International soccer news, recently ranked the areas with the best chance of winning the bid for an expansion team. The Tampa Bay Rowdies appear to be proverbial frontrunners. Bill Edwards has the political capital within the American soccer scene to make a major push, and he’s utilized those resources to make a big push for one of the two expansion slots up for grabs in 2017. The green and gold soccer squad made their intentions clear when they made the jump from NASL to USL in 2016. The team has won 7 games this season — the latest W coming from a match that stretched on until midnight due to lighting. Their record puts the Rowdies in prime position to clinch a playoff berth with 14 matches left in the season. For MLS officials, the final decision will depend upon more than just wins and losses. The stadium and local fanbase will certainly play a major factor in figuring out which team is ready for the major leagues. On May 2, St. Pete voters overwhelmingly supported a referendum that allows the city of St. Pete to enter negotiations with Bill Edwards for a 25-year lease on Al Lang Stadium. Edwards plans to invest more than $80 million to renovate and expand the Rowdies home field. Improvements include increasing the stadium’s capacity to 18,000. The roar of Ralph’s mob and cacophonous applause from new fans in the Burg continue to lead the Rowdies charge forward. Praise from residents, heavy backing from Rowdies owner Bill Edwards, and unanimous support from local officials seem to allude to the Burg becoming a Major League city. This past winter, Edwards and Rowdies officials flew up to New York to meet with MLS officials to present their bid. While we wait to learn the Rowdies’ fate, you can find us and the rest of the community with painted faces and hooped sleeves in the stands of Al Lang. 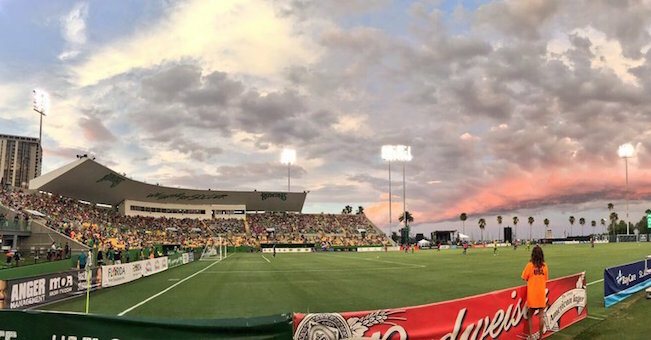 Help bring #MLS2STPETE by selling out Rowdies home matches. Purchase your tickets and view the team’s entire 2017 schedule online. You can read SBI’s full article here.